Jeffrey Friedl's Blog » Lightroom 4.0 is Out! After a two-month public beta, Adobe has just released Lightroom 4.0. It's not a free upgrade, but with the price now cut in half (upgrades are now $80), it's an easy decision. * There's a lot new if you're coming from Lr3, the most important likely being the new rendering engine. Laura Shoe has a post and video about what's new here, and Victoria Bampton's always exhaustive “what's new” list is here. One big thing you'll notice is that plugins that had been registered in Lr2 or Lr3 are now no longer registered, an unfortunate side effect of how I designed my plugin registration system some years ago. If you want them to be registered, you'll have to register them again sometime in the next six weeks or so, though as before, you can do so with just 1 cent. Sorry for the hassles. 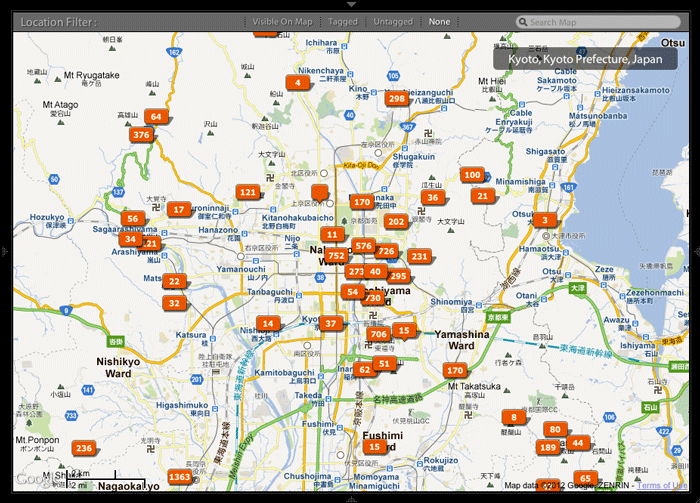 If you've been using my Geoencoding plugin, you'll be excited about the new Map Module in Lr4. The first time you bring up Lr4 with a recent version of the plugin, all the plugin's location data (its “shadow data”) is migrated over to Lr4's native data. Personally, I've found that the Map Module is great for manual geoencoding, for browsing, and for searching, but I still prefer my plugin to geoencode from a tracklog. I find Lr's tracklog geoencoding difficult to understand, and it bothers me that it doesn't handle altitude. My plugin does. The plugin also includes a bunch of stuff that'll be useful regardless of how photos get encoded, such as the ability to view mapped locations in a variety of online mapping services, or in Google Earth. Especially if you have a large corpus of geoencoded photos, the first thing you'll want to is jump into the map module to play, and in this you will be greatly disappointed because Lightroom apparently has to do a lot of processing under the hood before it's ready. Apparently, Lightroom needs to do something with each image under the hood before the transition from old plugin data to native Lightroom support takes effect in the Map Module and in the Library Grid Filter, and it's very slow. We're talking hours to handle the 22,000 photos that had been geoencoded with my plugin. It's not fun to wait, but even worse, Lightroom gives you no indication that it's still working and that the data it shows you is incomplete. So, it's probably best at some point to open the Library Grid to “All Photographs”, select “GPS Data” in the metadata filter, and walk away to let Lightroom grind for a while. One more warning: if you use a custom Color Label Set (“Metadata > Color Label Set” is anything other than “Lightroom Default”), you may be very surprised to find that after the upgrade to Lr4 it has been reset to “Lightroom Default”. This can be a fairly major problem because when you assign color labels, you're actually assigning the label and not the color, and if the label set has been changed out from under you, you'll unknowingly be applying the wrong label. So, be sure to check your color label set. Most of my plugins still work in Lightroom 2, but with the aggressive price lowering in Lr4, I expect most people who are still running Lr2 to move over, so going forward, I don't expect to put much more energy to continue to support Lr2 in my plugins. Great post and great catch. I never noticed the color label set trouble while working with the Beta! Thanks for the heads-up and for all your hard work getting the plugins ready for the new version. We all appreciate it. Hi Jeffrey, thanks for the post again. if I’m using your geoencoding plugin and want to upgrade, can LR4 recognize the ‘shadow data’ and migrate smoothly? The link to Laura Shoe’s video and blog post is broken (“href://” as protocol instead of “http://”). I’ve been using LR3 for a while now after learning about it here on your blog. By any chance, does the new LR4 have a magic wand tool? I’m completely baffled as to why they wouldn’t have such a vital tool. Maybe I’m missing it. Some LR features are so intuitive and some of them are so completely random… ahh, I guess I’ve been using a PC too long. I’d like to take a second to say thanks to for all your continued hard work on the lightroom plug-in front. Not only do you have the best set of lightroom plug-in’s I have ever seen, but you work tirelessly (I am assuming that ) to keep them updated, bug free AND give them away for donations. As well as respond to any email’s regarding lightroom plug-ins, photography and, well, everything else us crazy people ask! Thanks Jeff, Thanks a lot. I am pretty sure you don’t need too, monetarily speaking (assuming again), but if you ever decide to host a workshop in Japan, I am sure it will sell out immediately. I for one would love the opportunity to view Japan (and a little expert photography guidance can never hurt). Your website is amazing and your pictures, superb. Cool to use all your plugins with my new LR4 !! 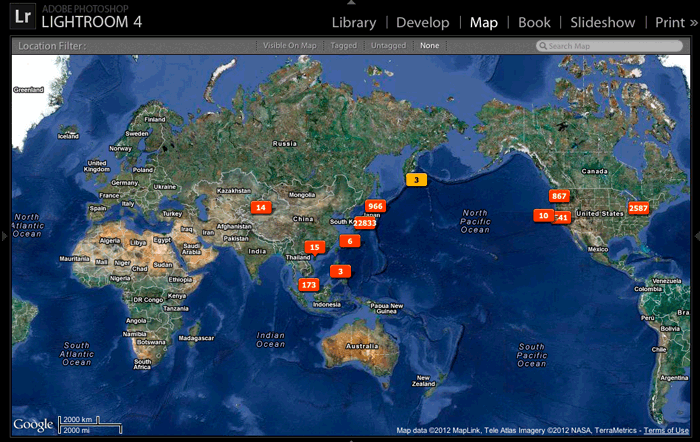 Small question, it’s possible to get geotagging for my picture on Flickr to my LR ? Thanks’s for the great job, I think too that I will keep using your geoencoding plugin. First thanks for the greast work. I’ve upgraded to LR4 ans at my first import from a tracklog it took very long. (1400 photo’s 15 min+.) does it take longer or is something going wrong? With geoencoding now built in you’d think I’d be a happy camper. But no… because it’s still faster for me to encode static photos with no corresponding tracklog in LR3 using your plugin, Google Earth and the Alt+F S R shortcut to grab coordinates from GE. I have GE open anyway for viewing the tracklogs. In the beta, accessing your Geoencode dialog changed into Alt+F X, right arrow (because both “Plug-In Extras” and “Exit” now had the X as their shortcut so it didn’t auto-open the submenu) G, (because I have another plugin that uses “G”). Now with the release they’ve changed the Plug-In Extras submenu to use “U”! So the simple, FAST, one handed keyboard shortcut from the last version has turned into the two-handed “Alt +F, U (maybe they’re trying to tell me something with those last two), right arrow, G, Enter. Another odd choice since the second U in the file menu is Clear Quick Collection… which already has a predefined shortcut of Ctrl+Shift+B. ARGGG! Thanks for having a place to rant but more importantly, the work on the plugins. I’ve re-registered all and happily re-donated to the ones I use the most. Great work Jeffrey, really apreciate it! I have a question for ya, currently when i update or upload images to flickr from within lightroom it may not update the GPS coordinates. Is this something i’m doing wrong from my end or is this something inherent in lightrooms design and fixable with your plugin? Very impressed with the smooth transfer of shadow data into LR4’s format. Thank you! New to LR (and digital photography) so started exploring best options to geocode my photos. 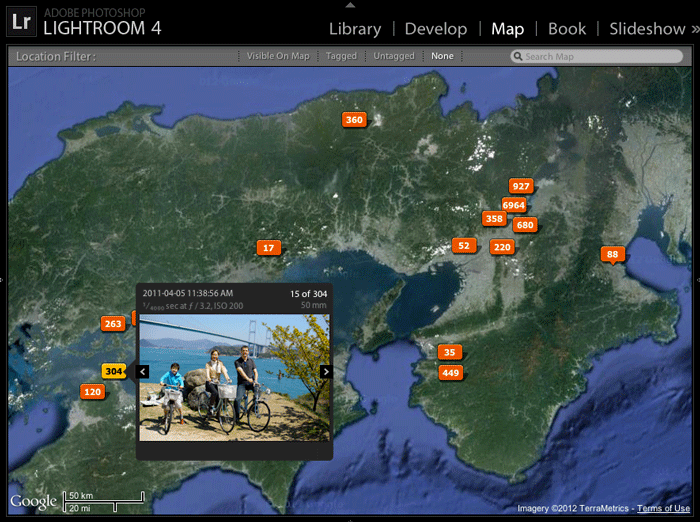 I used LR4.3’s Map tool (imported gps coordinates from Garmin GPS) and tagged pictures from my Canon. I had a few questions about both of your plug-ins (geoencoding as well as export to picassa). 1. Do both your plug-in and LR4 add the GPS data directly to the .cr2 files downloaded from the Canon? I think LR4 saves metadata in a “sidecar” file. Does it really matter how it’s saved or is it better to have the GPS data embedded directly in the same file as the photo? If the latter, does your plug-in do that? 2. If there are differences beween LR4.3 and the plug-in, can you pls better describe the differences between the capabilities of LR4.3 geotagging vs. the geoencodin plug-in? 3. With the Export to Picass plug-in, will it save the GPS metadata if I choose to upload pictures in .cr2 format or would have to upload in jpeg format? Thanks in advance for your guidance before I download one or both of the plug-ins. I’m playing with LR5 Beta and have gotten the message that my version of Geoencoding Support doesn’t work in LR5. It asks me to upgrade my copy of the plugin; however I don’t see anything LR5 specific on your site.